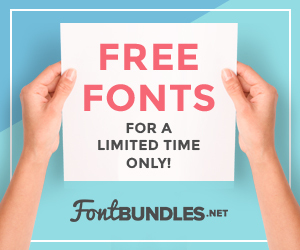 This post is brought to you by Smartpond. The old pond was not even pretty! It needed a lot of work done to make it look good. The octagon shaped thing in our drawing is a sort of deck, to place a half barrel on to hold the fountain. Because our yard is not very level, and we wanted to be able to place pots of annuals around the pond and plant perennials in the ground as well, we decided to build the small deck. 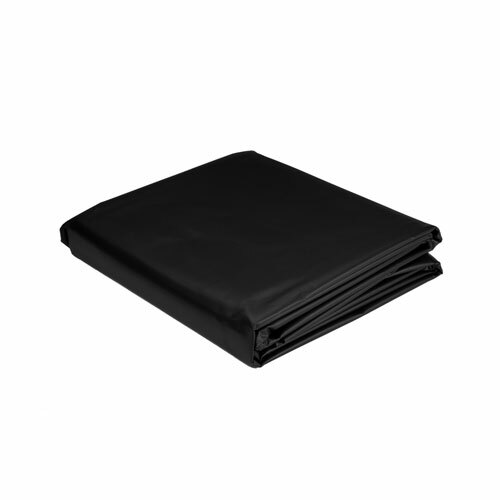 It measures about 2.5 feet on all sides. We hire a local handy man to do things like this for us because we are both disabled, but it is an easy project to do on your own if you are handy with carpenter tools. 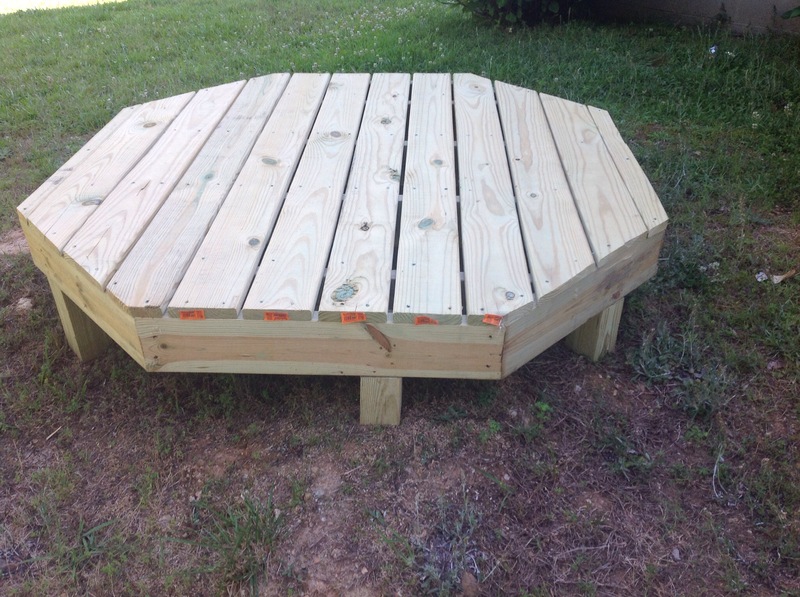 The cost of the deck supplies was a total of $140.00. 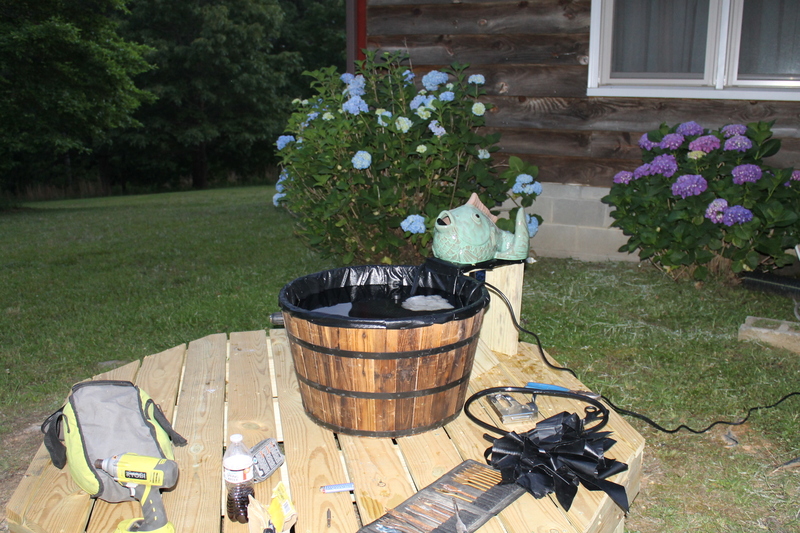 The handy man charged us $100 to go and pick up supplies, build the deck, and then put the fountain together for us, and to add an outdoor electric plug. It doesn’t look like much all by itself. Some of my friends stopped by to ask what the heck it was! The deck for the pond was completed for a couple weeks. People in the neighborhood stopped to ask what it was. 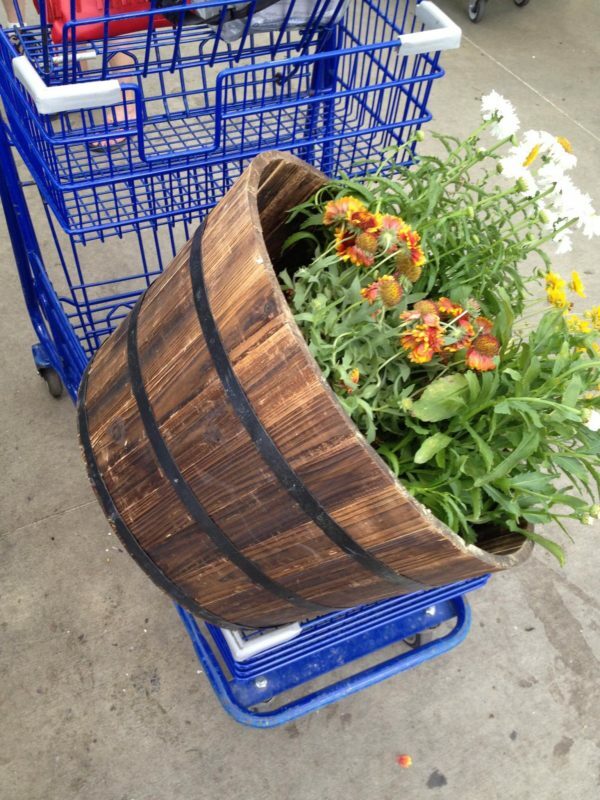 I got my 1/2 barrel and some pretty flowers at Lowes. 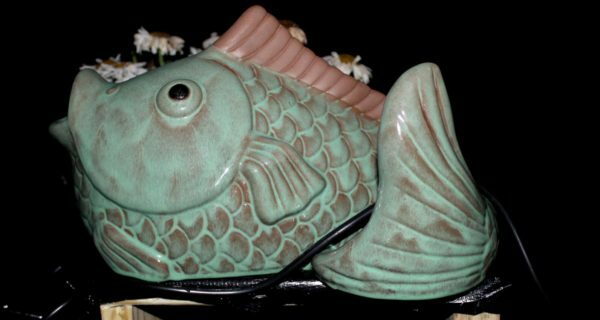 Along the way, after we had made our original design, I found a cute fish ceramic ornamental statue thing that I just fell in love with. It was just about the same price as the pump handle we had talked about, and I liked it more. So, for $39, I bought the fish to use as the “spit” for the fountain. It already had a hole in the bottom, so it was a perfect choice. The ceramic fish I found. Isn’t it fun? The other day, my handy man came back to put together the fountain. 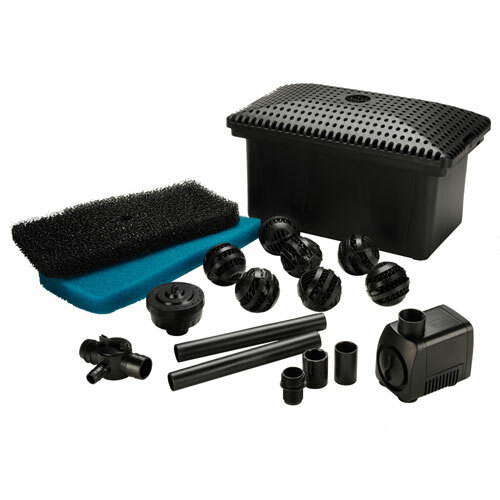 We had a Smartpond Complete Pump Filter Kit, which is available at Lowes. 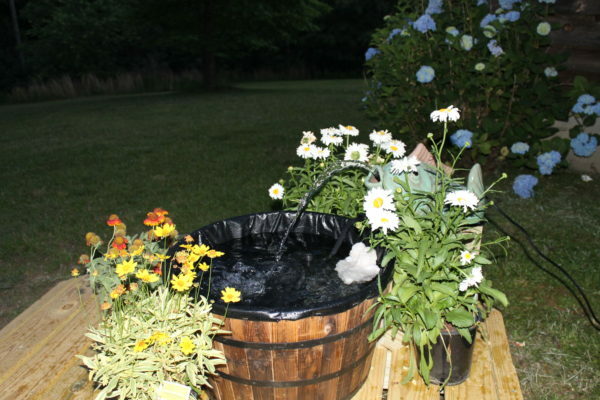 It is a complete pump system, which makes building a fountain so easy even I could do it. All there was to it was to immerse the pump in water, hook up the 1/2 inch tubing, and plug it in. 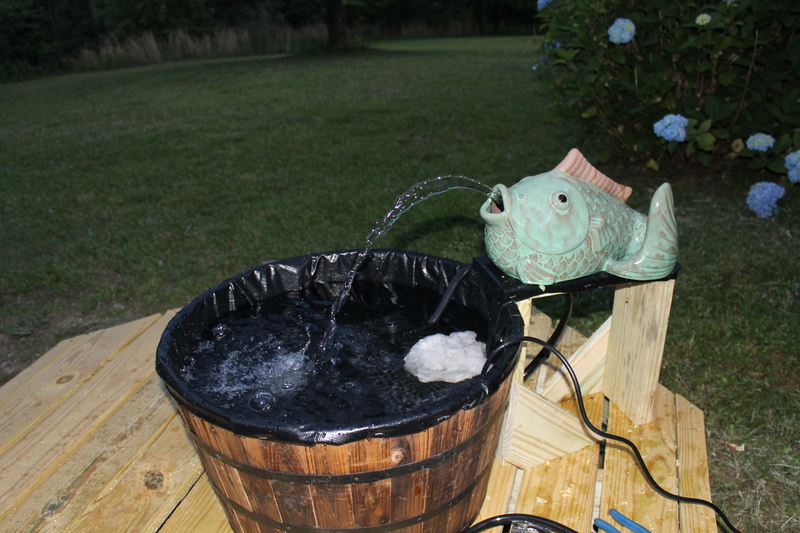 We had that fish spitting water in no time at all! The half barrel we used for the pond project. 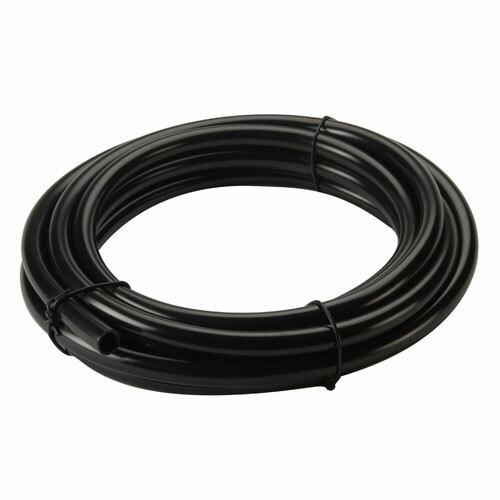 The smartpond® 1/2-in Flexible Vinyl Tubing Model #: VT1200. This was used to connect the pump to the ceramic fish. So, when my handy man came back, he cut the liner to fit the half barrell, and stapled it to the top of the barrel. 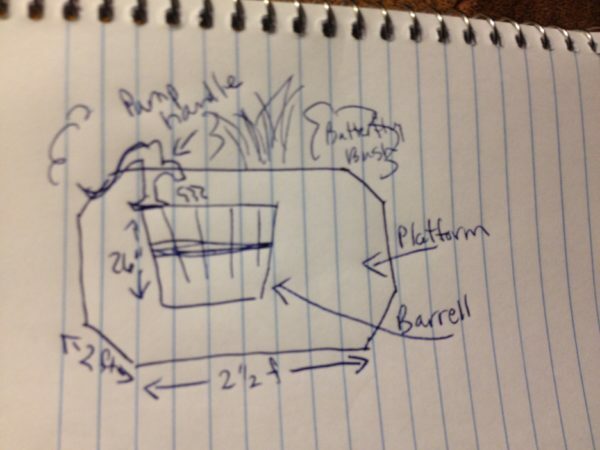 Then, he built a wooden platform for the ceramic fish to sit on, and lined the top of it with leftovers from the liner. Next, he immersed the pump and filter kit in the water, and attached the half inch tubing to it. 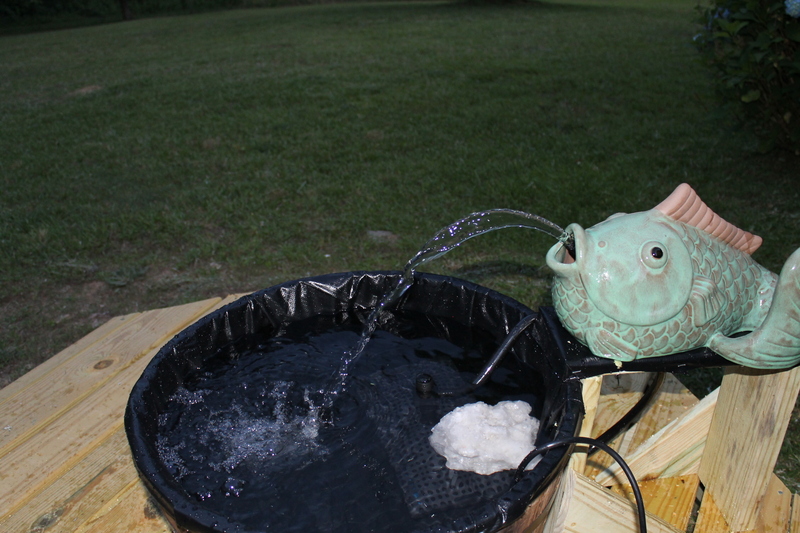 The tubing was connected to the pump, up over the back of the barrel, and through the hole in the bottom of the ceramic fish. The tube was threaded through the fish to come out just at the mouth. When the pump was turned on, the water started spitting out of the fish’s mouth. This whimsical pond is exactly what I had envisioned when I saw that fish, and like I said, it was so easy to do I probably could have done it myself, if not for the carpentry work that needed to be done. 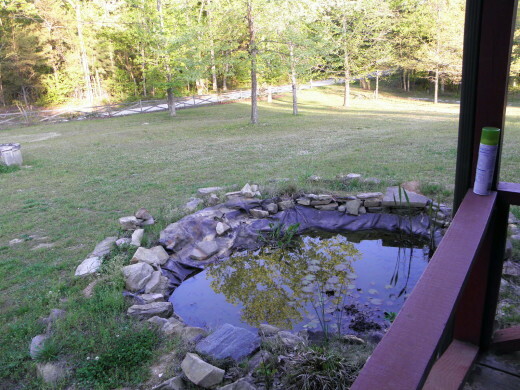 The finished pond. It just needs flowers now. The ceramic fish is so cute spitting the water out. I love this fountain! The fish is perfect for this fountain. This is sort of what it will look like when we have planted flowers around. They will hide the working parts. 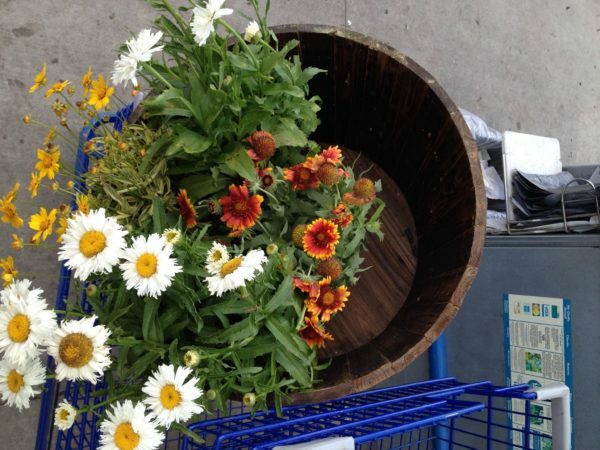 I am so excited to be planting flowers next. So many birds, such as humming birds, goldfinches, wrens, pine siskins, and more, are attracted to the sound of running water. The flowers we are choosing are ones that will also attract humming birds and butterflies. What do you think of my Smartpond Fountain project so far? To see the pond with flowers planted, and video of it running, click here. I love the fish. It is just too cute. I’m sure you’ll see lots of butterflies with all of those pretty flowers. This turned out great. I love the fish fountain. Nice you can change out the plantings as well. Love this! What a great project! 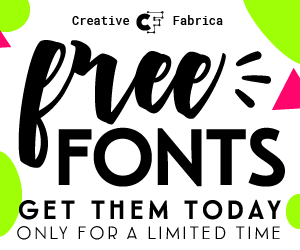 Thanks for sharing the step by step! Love your fountain project. So cool. and you can change it up with different flowers.